In addition to our public truffle hunting experience days, we are now able to offer bespoke, private truffle hunts in Hampshire. These may be for a corporate team as a reward for a job or project well done, for your clients / customers, a group of friends or even a large gathering for your family. Holiday tour operators, would you like to offer exclusive truffle hunts to your guests? Bespoke events are however, more flexible than our public truffle hunts. We can alter the programme and adjust the quality of the indoor venue / menu to meet your requirements and budget. At one location we can incorporate wine tasting and a vineyard tour into the itinerary at another you can visit a gin distillery. We can also organise transport / railway station pickups etc. Our locations are reachable in one and a half or two hours drive from central London. Alternatively, nearby railway stations are about an hour from Waterloo. Another option is for us to come to you if you have suitable woodland. We recently took 22 members of the same family representing three generations truffle hunting on their estate. 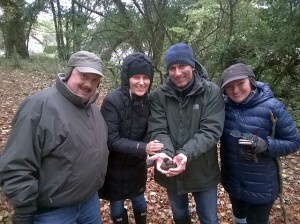 If you organise events on your estate, truffle hunting might be something we can help offer your guests. Please contact us to enquire further.